Robert Kubica will take on his third new rally in succession with the Ford Fiesta RS WRC next week as the FIA World Rally Championship (WRC) returns to gravel for the 2014 edition of Rally Mexico. Despite some exposed gravel at the previous outing in Sweden, next week’s adventure will be a completely new challenge as crews swap sub-zero temperatures for those as high as 30˚C. The blistering heat places huge demands on man and machine alike, as do the high altitudes witnessed nowhere other than the Mexican fixture. Stages climb over 2,500 meters above sea level which make precision driving paramount. With the oxygen-starved air reducing power by as much as 30 per cent, even the smallest of mistakes are hard to rectify and a considered recce coupled with all-out commitment on the stages are a must. Thankfully, commitment is something Robert and co-driver Maciej Szczepaniak are not lacking. Determined to make the most of another new challenge, the RK M-Sport World Rally Team pairing will be looking to make it through all 22 stages unscathed – taking maximum knowledge and experience from the first long-haul event of the year. The gravel tracks offer more consistent grip levels than those witnessed in the championship to date and will provide the perfect opportunity for the Formula One race winner to get more accustomed with the Fiesta RS WRC. The Pole also has form on gravel. In his WRC 2 championship winning year, he claimed dominant victories on the loose-surface stages of Greece and Sardinia – as well as the mixed surface speed tests of Spain – and will be hoping to carry that momentum forward as he embarks on a new campaign across the Atlantic. Having contested a full day’s testing in the mountains of Northern Spain, Robert and Maciej are well prepared for the task ahead. Simulating the power and performance expected at next week’s event, the Polish pairing are determined to achieve their goals in Mexico. “From what I know, the stages of Rally Mexico are contested at very high attitudes. This means that there is a significant reduction in power which also influences the driving. 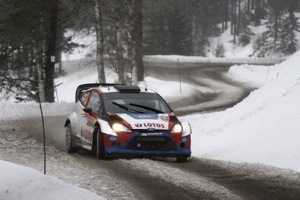 “This year there will be a lot of long, very demanding stages and I think it will be a challenging rally for a newcomer. It will be my first time on gravel with the [Ford] Fiesta RS WRC and my first time in Mexico so my aim is to finish the event with some good experience – hopefully without mistakes like those in Sweden. “The approach is exactly the same as always. I will try to gain as much information as I can, but I also need to discover the rally for myself. Hopefully Maciej [Szczepaniak, co-driver] and I can have a smooth recce and enjoy the stages as we look to learn as much as we can. “From what I can see, some parts of the route are very similar to the stages in Greece. I don’t know how hot it will be inside of Fiesta, as I haven’t yet had the opportunity to drive in such conditions, but last year I did not have any issues on the longer stages. “Of course they are more demanding then the short stages, but I am used to being in a car for long periods of time and the races in Formula One are much longer then the stages we’ll encounter next week. The approach and the grip levels are different, but from a physical point of view I have no concerns about driving a 50 kilometre stage.